Ireland trail Afghanistan by 120 runs with nine second-innings wickets remaining after day two of their one-off Test match in Dehradun, India. Having started the day on 90-2, the Afghans were bowled out for 314, Rahmat Shah top-scoring with 98 and Stuart Thompson taking 3-28. Ireland lost William Porterfield for a duck in the second ball of their innings and ended the day on 22-1. Andrew Balbirnie is 14 not out and Paul Stirling eight not out at the close. Skipper Porterfield was caught by Ikram Ali Khail off the bowling of Yamin Ahmadzai. 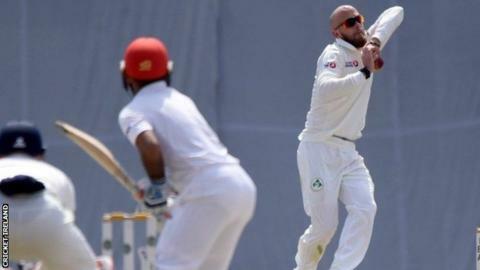 After bowling out Ireland for 172 on the opening day, Afghanistan took control on the second day at the Rajiv Gandhi Stadium, building up a first-innings lead of 142 runs. Rahmat Shah and Hashmatullah Shahidi (61) put on a partnership of 130 for the third wicket and Asghar Afghan produced some power hitting to score 67 with the help of six fours and four sixes. In addition to Thompson's three-wicket haul, Andy McBrine, debutant spinner James Cameron-Dow and George Dockrell took two wickets apiece. Thompson believes Ireland can still win the contest despite Afghanistan's strong position after day two. "There's still three days to play in this Test, and a lot of time to bat," said the Irish all-rounder. "If we can put on some big partnerships - the two lads tonight looked set so if they can kick on and we bat for a long time then we can go past them and get a big lead."